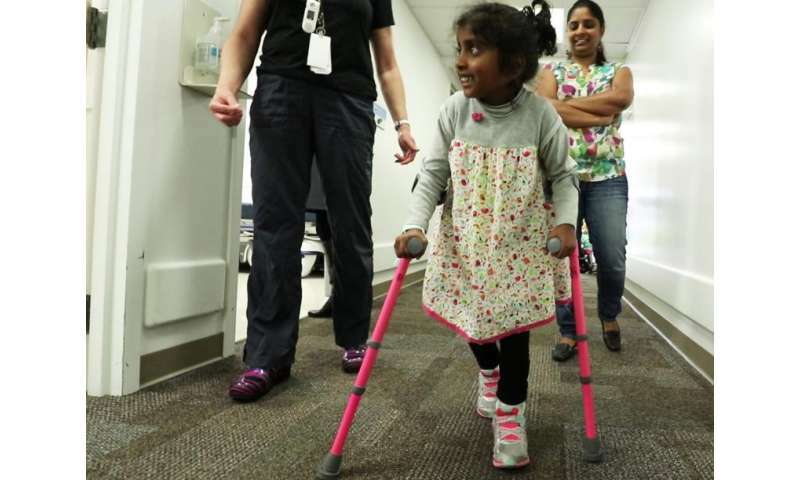 Bhoomi Manjunatha, age five, walks with crutches three months after having surgery at Nationwide Children’s Hospital. Bhoomi Manjunatha, age five, has been able to rely less on her walker and wheelchair, and more on her own two feet, because of a surgery performed at Nationwide Children's Hospital. Her hard work and determination in physical and occupational therapy post-surgery has also helped Bhoomi continue to make strides. The spinal surgery Bhoomi had in January, called selective dorsal rhizotomy, was performed by Jeffrey R. Leonard, MD, chief of Neurosurgery at Nationwide Children's. In the operating room, the surgery team anatomically divided out dorsal nerve roots which control the sensory portion of the spinal cord. They stimulate them electronically to determine which rootlets were abnormal and section about 60 percent of the feedback to prevent the tightening and stiffness that Bhoomi experienced. "The surgery went well, but my part is easy. It is Bhoomi who has months of hard work and therapy ahead of her to strengthen her muscles to take advantage of her newfound mobility," said Dr. Leonard, who is also a faculty member at The Ohio State University College of Medicine. "Without a multidisciplinary team of inpatient rehabilitation, outpatient physical therapy and occupational therapy working together, the benefits of rhizotomy would not materialize." "Bhoomi is bright and energetic, you can see that from her smile. She is motivated and did everything that the therapist asked of her, working really hard in rehabilitation," said Dr. Leonard. "I think she is going to be dramatically effected in a very positive manner after having undergone the rhizotomy." Dr. Leonard says there is data for different treatment options for spasticity: orthopedic procedure, therapy alone, pump placement and rhizotomy. However, there are very few studies that have compared them, so he discusses with the family what is available, what has been studied and where the limitations in the data exist to determine what the best treatment options are for each individual patient. Dr. Leonard's team is currently collecting more information to help fill the gap in data. At Nationwide Children's, every child diagnosed with a condition requiring neurosurgical expertise is handled with an individualized treatment plan. Children with spasticity must be screened and tested to determine if they are a candidate for rhizotomy. Request an appointment here.